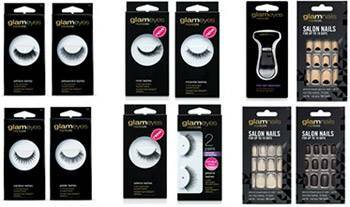 Customise your look with Glam's four NEW lash styles as you strut down the runway of life. Designed with the everyday glamour girl in mind, these 4 lash designs will set you apart with lashes that exude dramatic, voluminous, luscious or alluring style. Choose your individual lash to suit your style from Adriana, Alessandra, Gisele and Candice and team your lashes with accessories that set you apart from the rest. The NEW 4 Glam core lashes are gorgeous additions to the Glam Core range of false lashes taking inspiration from the most desirable women in the world. Designed with perfection, Adriana, Alessandro, Gisele and Candice offer two ultra-light reusable lashes to take your look from naturally beautiful to stand-out sensational. Adriana: For dramatic glamour, this lash will give you the power to stand out with extra volume for double lash density. Alessandra: Designed for the desired effect, the criss cross action adds length and volume while maintaining a natural look. Candice: Styled to perfection, the tapered lashes give the illusion of larger, alluring eyes.